Pure-Ecommerce is thrilled to bring you this specialty online boutique featuring a variety of products with a Victorian chic flair! 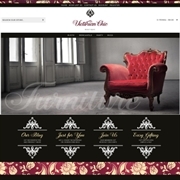 Introducing VictorianChicBoutique.com – this appropriately name website features a Victorian-inspired design and has a memorable domain name sure to draw attention to online shoppers. Plus, this site features all dropship products and in the collection, shoppers can shop here for stylish furniture, beautiful gifts, chic jewelry, classy accents, plus much more. The easy to navigate categories help online shoppers to find all the essentials they need to add a little “Victorian Chic” to their lives! This is a 100% responsive design website, which means it will look fabulous whether customers are shopping from the convenience of the PC, smartphone or tablet. You will be able to reach out to your customers through the connected social media pages, blog, and newsletter. You will not only be able to market the adorable dog products through these various outlets, but you will also be able to share helpful tips, exciting news, sales and more! The team at Pure-Ecommerce will research, contact and gain approval for the initial drop ship product vendors, as well as, load the first 100 drop ship products to get you started. Once you become the owner of this website you will be able to select the next 200 products that we will load for you. By working with drop ship vendors you do not have to hold any bulky or expensive inventory, plus you can work from home on your own schedule. When you work with us you will also receive 40 hours of step-by-step ecommerce consulting and access to our exclusive eLearning Library. During our 10 step process, you will learn to set up, market and manage your new online business. Need additional assistance? Then you should consider our platinum package upgrade, it includes many perks to jump start your online business even more! Are you interested in this chic website? Act now - Take the first step – request more information and to learn more about how we can help you get started!